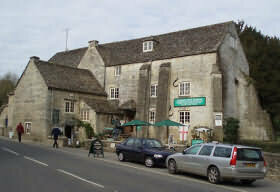 The village was once described by William Morris as 'the most beautiful village in the Cotswolds'. The village centre clusters around a square near St. Mary's, a Saxon church. Some of the Saxon remains inside the church are replicas as the originals are housed in the British Museum. Bibury has provided the backdrop for blockbuster films including Stardust and Bridget Jones's Diary. 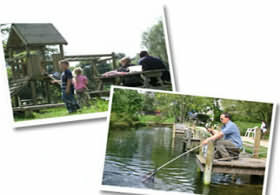 Bibury Trout Farm and restaurant where you can catch your own trout. The restaurant serves fresh trout meals. Strolling alongside the river watching the trout in their live habitat and visiting Arlington Row. Don't miss a visit to the beautiful gardens at Barnsley House at Barnsley 3.3 miles away. 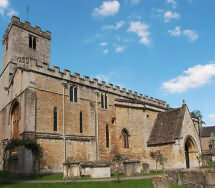 The Church of St Mary the Virgin is located to one side of the village on higher ground than the river and the bridge. Here we have a church of Saxon origin, probably founded in the mid 8th century, though the surviving earliest feature may owe more to the 11th century. There is much to see, from the Saxon and Norman carvings, to medieval windows and stained glass, and the striking chancel arch with evidence of Saxon, Norman, and Early English work. St Mary's is a delightful church, and well worth a visit. A peculiar tale attaches to a section of the churchyard, which has been known for centuries as 'The Bisley Piece'. Bisley is a village about 17 miles to the west of Bibury, near Stroud. The inhabitants seemed to make a habit of running foul of church law. In the 13th and 15th centuries Bisley was placed under interdict by the pope. One consequence of the interdict was that the people of Bisley were not allowed to bury their dead anywhere within the Diocese of Worcester for the duration of the penaly. The closest place outside the diocese which would accept Bisley burials was at Bibury. Away from the sightseeing crowds in Bibury, a delightful walk through woodland and meadow rich in wildlife, across a Roman road and past a hidden dewpond. 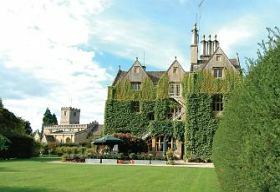 Bibury Court - magnificent Jacobean mansion now used only for exclusive weddings and private party venue. 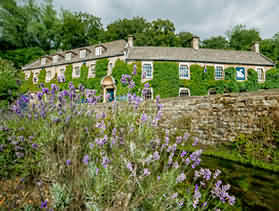 The Swan Hotel and Trout Farm Restaurant.